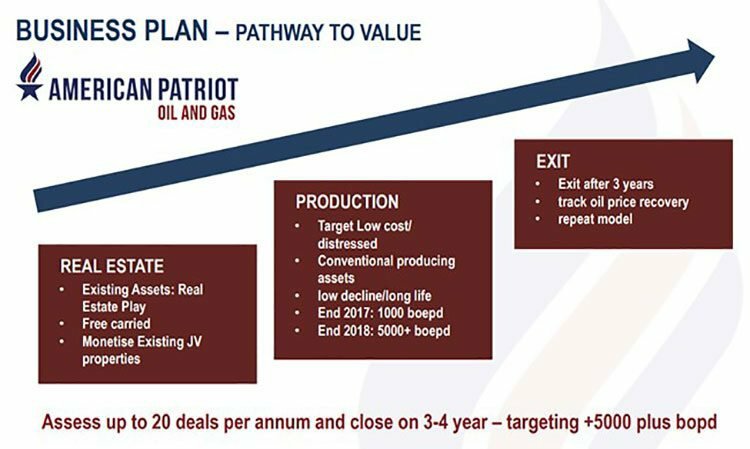 American Patriot (ASX:AOW) has embarked on an acquisition spree aimed at distressed assets that it hopes will net it a significant producing business, reaching 3,000 BOPD by 2019. The goal is to pay just cents on the dollar for viable oil production resources that any oiler would want to summarily add to their production portfolio. ..but with many oilers still locked into assets they cannot utilise or commercialise. AOW is actively cherry-picking the best assets across the US Texas and Gulf Coast regions, and has already amassed around 300boepd of active production. 300,000 barrels proven oil reserves/USD$11m revenue. 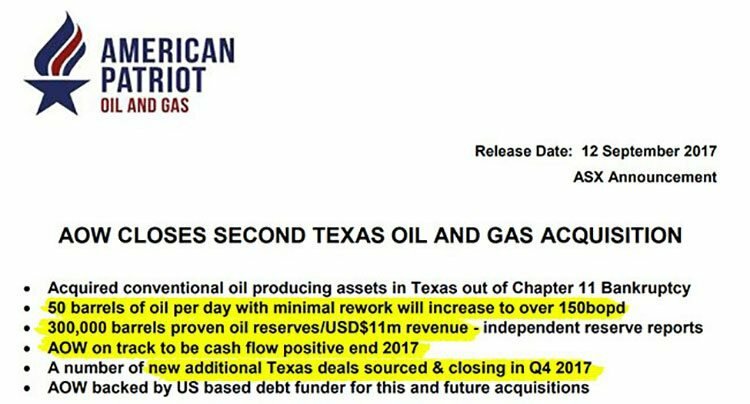 AOW remains on track to be cash flow positive by the end of 2017 and already has its eye on a number of new additional Texas deals that it is racing to close in the fourth quarter this year. Over the longer-term, AOW intends to raise its production calibre to over 3,000bpd, therefore handing this micro-capped oiler the commercial arsenal it needs to raise its tiny $5,5 million valuation over the short to midterm. 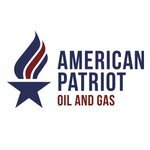 American Patriot (ASX:AOW) is a company on the lookout for a quick entry into profitable oil production and The Next Oil Rush is constantly looking out for undiscovered oil stocks that may be on the cusp of something big. Did you see our coverage of SGC? 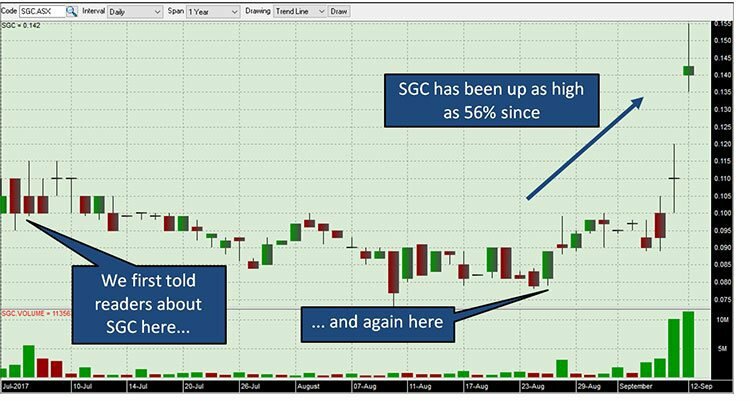 We recently wrote about Sacgasco (ASX: SGC) back in July and August . AOW could be on the cusp of a similar run. ...AOW is opting for a more speedy and pragmatic approach. AOW is selectively picking up the most amenable oil wells scattered around the US, and folding them into a concerted oil productive strategy that is eventually aiming to achieve around 3,000 barrels per day once fully completed. When we last updated you on AOW in the article AOW Acquires Producing Oil & Gas Reserves: More Acquisitions to Come , the company had picked up a game-changing acquisition for US$4.5 million, with low production costs set to translate into strong margins. These assets are expected to generate more than US$2 million in annual net cash flow, at US$47 a barrel oil prices. This second acquisition at a low cost entry point brings AOW an immediate increase of 50bpd, and a likely increase to 150bpd in the near term. This Texas-based asset also holds 300,000 of proven oil reserves worth $3 million at current oil prices of $45pb. Combined with existing assets, AOW is now on track to achieve production of 300boepd by the end of 2017, with 1 million barrels of proven oil and gas reserves certified by independent reserve reports. The assets are being acquired using existing AOW cash plus funding from a significant US based funder, with whom AOW will work to acquire this and future conventional assets. Both fields are mature legacy assets with current daily production of 51bopd shut-in, with significant proven behind pipe pay that has not yet been exploited with the ability to grow production significantly for minimal capital expenditure. There is also substantial workover and behind pipe potential on the existing wells and existing infrastructure is in place consisting of pump jacks, tanks, batteries and piping. Minimal work and capital is required to bring these fields back to life, but importantly for AOW, the field consists of 37 recompletions and underdeveloped wells with significant upside potential. AOW sees this as the second acquisition of many, with a number of attractive new target assets already sourced as it looks to deliver on the strategy of aggressively building a producing conventional oil business with well over 1000bopd production in 2018. Lost Lake/Goose Creek acquisition includes 50 bopd shut in and 1P proven reserves of 300 mboe. The assets have been acquired from the major lender Solstice Capital LLC at the Bankruptcy court in Houston. 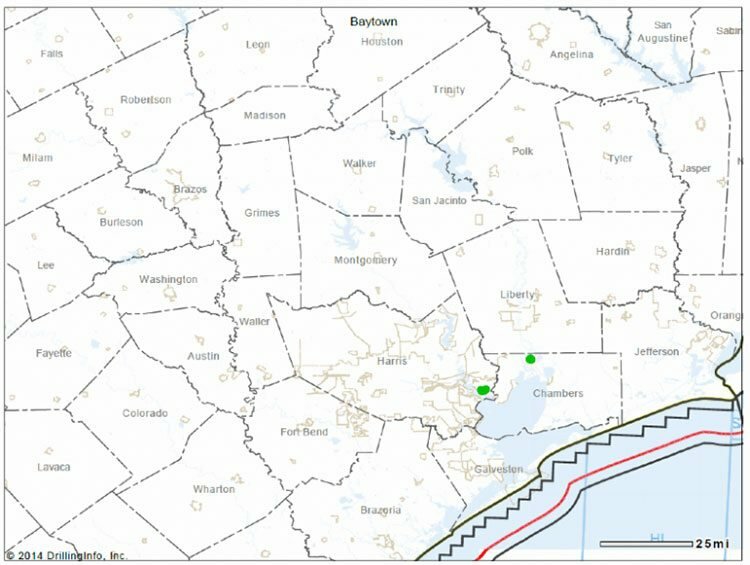 The assets consist of 65 oil wells covering approximately 340 leasehold acres HBP at 100% GWI/average 75-81% NRI in Harris and Chambers counties Texas. The Lost Lake field is located in Chambers County and encompassed the entire Lost Lake Salt dome. Wells produce from the shallow Miocene zones with cumulative production of 1.37 million barrels of oil and 230 million cubic feet of gas since first production in the 1970s. Existing 2D seismic has identified 8-10 additional infill-drilling sites upon the leases. The primary objective is to return the shut-in wells to production and rework behind pipe zones. The Goose Creek Field is located in Baytown Texas. The wells produce from the shallow Miocene at depths from 1200 to 3860 feet. Cumulative production of 1.8millions barrels of oil has been recovered since the first production in the 1950s. Rework of the shut-in wells should result in daily production increases in the range of 25-30bopd per well at minimal capex to rework the wells. In addition there are numerous additional locations for infill drilling targeting 50 to 100bopd per well targeting additional reserves of 300,000 barrels of oil. The producing wells are fully equipped while many of the shut-in wells have tubing and or rods in them. Conventional oil exploration is whole lot cheaper than shale and can remain profitable despite oil prices languishing below $40pb. This premise underpins AOW’s overarching strategy and could likely see AOW achieve cash-flow positive status as early as this year. Not a bad sight for an ASX-listed oiler, worth merely AU$5.5 million. Clearly, there is some upside revaluation potential here. 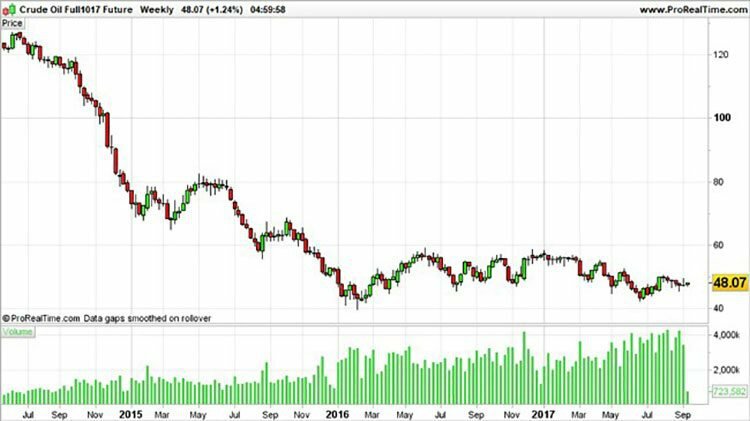 Having taken a swan dive from their lofty $150+ peaks in 2014, oil prices have remained in a stable $40-60 range for over 2 years. This is a good backdrop to be picking up distressed assets for cents on the dollar. If oil prices do make a significant recovery, this bodes well for AOW. If oil prices remain in their recent range, AOW can sustain its existing strategy. And worst case, if oil prices suffer again, AOW can maintain viability down to as low as $22pb, given the cost-base conditions in the US. All commodity-based investments are inherently risk propositions, but when so many factors have been accounted for and mitigated — we think AOW represents a worthy entry into small-cap Resources investing. With over $1.3 million in the kitty from a recently oversubscribed capital raising, AOW intends to invest every penny in securing oil productive assets. Targeting distressed assets is a priority and AOW is certainly now meeting its targets. Any oiler needs ample funding regardless of flow rates, oil prices or location. On this front, AOW now has some heavy-hitting financing to ensure its cherry-picking strategy pays off. Just recently, AOW announced an oversubscribed $1.3 million capital raising, which is a great sign at this early stage. From a fundamental perspective, institutional money seems to be backing AOW and its intentions — which can often be an early-warning sign for future revaluation. In addition AOW has the benefit of a big brother US funder supporting and funding its US acquisitions. 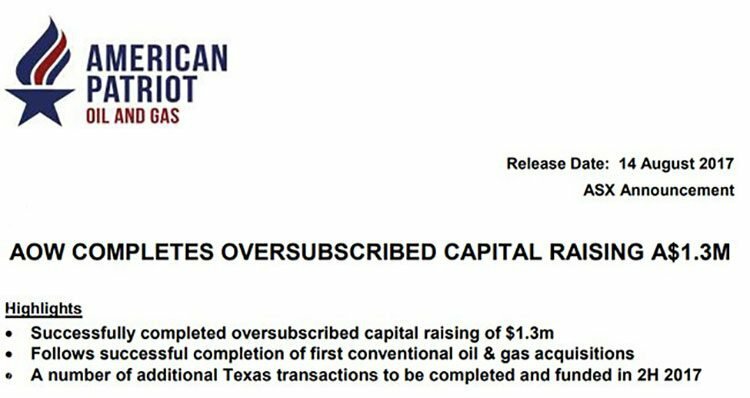 AOW will use the funds from this cap raise to fund further acquisitions of conventional oil and gas projects in Texas. Such acquisitions are likely to be purely value accretive and self-financing; which means AOW is advised to do as many as it can and as quickly as possible. From a sentiment perspective, the fact that AOW’s cap raise was oversubscribed, is a likely indication that both institutional and retail investors are fully on-board with AOW’s ‘acquisition-led’ growth strategy. Lethargic oil prices needn’t be a source of fear and anxiety for oilers — or should we say, well-run oilers. What the past few years have shown is that oil production is fraught with obstacles and risks, but, there is a definitive way of making a buck in oil regardless of the oil price. ...AOW wants to go back to basics and kick-start a simple, no-frills strategy built on pragmatism. AOW is blessed with 28,256 net mineral acres under lease across 5 key projects, scatted across the US Midwest. ...and the good news is, there’s more to come. We’re already on the lookout for more acquisition deals as part of AOW’s spending spree, and therefore, a fistful of catalyst opportunities coming down the track. AOW is targeting a number of acquisitions later this year and in 2018, which will all likely add confirmed oil assets onto its balance sheet. According to AOW , it has now “entered into multiple Letters of Intent (LOI) and paid refundable deposits on a number of potential oil and gas producing property acquisitions”, and “currently negotiating Purchase and Sale Agreements and Asset Assignment documentation with our preferred transactions”. Yet this remains a speculative stock and investors should seek professional financial advice if considering this stock for their portfolio. AOW remains in a strong cash position and by using a combination of external funding as well as existing cash reserves, to acquire its production assets — will likely mean AOW remains in a solid position financially, and therefore, could deliver on its ambitious land-grab across the US. In the next 12-18 months, AOW intends to expand its reserve/resource base and progress its aggressive acquisition strategy by restarting production at shut wells, rather than starting new ones. The focus is on cost efficiency, cash flow metrics and tight capital discipline. In oil, dividends remain sacrosanct for the Majors; but for smaller juniors, the operative word is ‘efficiency’. So many US-based oil companies have been carried out feet first over the past few years, but those that have remained have one thing in common — they are all efficient enough to endure an oil market downturn. AOW is pitching to become one oil company that has efficiency as its core principle. Shale exploration can be highly lucrative, but it’s also highly risky and highly expensive. In today’s oil market, capital expenditure is better targeted at low risk opportunities while companies looking for ‘growth’ are likely to falter at the expense of those looking for efficient production at all stages. The implications are that production profiles may decline and companies may get smaller — but returns should improve. This is what AOW is banking on, and going out there to make it all happen. This could be a good time to jump on and ride AOW’s coattails, all the way to the pump.